The rezoning application proposes to amend the City’s Zoning By-laws with a 4-storey apartment building containing 62 dwelling units and 65 vehicle parking spaces in one underground level at 35 Wabash Avenue. Information on the application is available on-line at: http://app.toronto.ca/DevelopmentApplications/associatedApplicationsList.do?action=init&folderRsn=3792517&isCofASearch=false, Supporting Documentation. The Staff Report recommends a community consultation meeting. City Planning and other city departments will have their comments on this application available at the community meeting. The meeting will likely be scheduled for January, 2016. City Planning staff will be notifying neighbouring residents. My office will be providing general notice throughout Ward 14. If you wish to be added to the email blast list for this application, please send an email to my office at councillor_perks@toronto.ca, with subject line 35 Wabash Avenue email list. The rezoning application proposes to redevelop the site currently occupied by a two-storey funeral parlour and two, two-storey commercial buildings with an eight-storey mixed-use building containing 93 residential units and six grade-related townhouses fronting a private driveway accessible via Howard Park Avenue. A total of 77 parking spaces will be provided in two levels below grade, including six visitor spaces. The mixed-use building will have a height of 25.7 metres (29.5 to the top of the mechanical penthouse) and the townhouse buildings will have a height of 15.28 metres. Information on the application is available on-line at: http://app.toronto.ca/DevelopmentApplications/associatedApplicationsList.do?action=init&folderRsn=3816210&isCofASearch=false, Supporting Documentation. The Staff Report recommends a community consultation meeting. City Planning and other city departments will have their comments on this application available at the community meeting. The meeting will likely be scheduled for January/February, 2016. 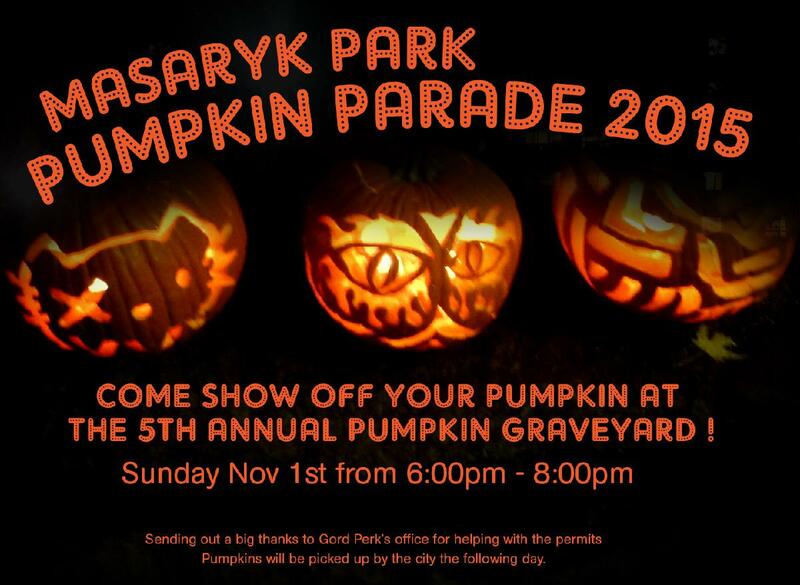 City Planning staff will be notifying neighbouring residents. My office will be providing general notice throughout Ward 14. If you wish to be added to the email blast list for this application, please send an email to my office at councillor_perks@toronto.ca, with subject line 422-30 Roncesvalles Avenue Street email list. In order to ensure that tenants know who they can contact if property standards are not being met, Municipal Licensing and Standards has created a public education campaign which will launch next week. To view this campaign, please go to: www.toronto.ca/rentalrights . Other components of the campaign include: advertising in newspapers (English and multilingual), online, TTC interiors, street level posters (convenience stores, etc), elevators in apartment buildings, a Tenant Rights 101 public education piece and more. Hundreds of thousands of people rent their homes in Toronto. Every person living in rental accommodation has the right to expect that property standards are met. Property standards are the minimum standards to which a property is maintained. The City’s Municipal Licensing and Standards division enforces property standards throughout Toronto. If you have issues with the physical condition of the property that you are renting (taps that don’t work, heat isn’t working, broken window), talk to your landlord first. If things don’t improve, call 311. Residents should communicate with their superintendent/landlord first. If the issues are not addressed in a timely manner, you should contact 311. Landlords and property managers have a responsibility to ensure that they comply with City bylaws. Renters have a responsibility to pay their rent and maintain their unit. Renting in Toronto? Know your rights. Know your responsibilities. • In a home that is clean, safe and secure. • With adequate heat, lighting and plumbing. • Take care of your unit and be respectful of shared space. • Allow your landlord to maintain your unit. The Preliminary Staff Report responding to the rezoning application of 1182 and 1221 King Street West will be reviewed at Toronto and East York Community Council on Tuesday, November 10, 2015. The rezoning application proposes to amend the City’s Official Plan and Zoning By-laws with a 21-storey residential building (73 m) with retail at grade and 448 residential units at 1182 King Street West and a 19-storey building (67 m) with retail at grade and 301 residential units at 1221 King Street West, located on opposite sides of the Dufferin/King intersection. Information on the application is available on-line at: http://app.toronto.ca/DevelopmentApplications/associatedApplicationsList.do?action=init&folderRsn=3790808&isCofASearch=false , under Supporting Documentation. The meeting will likely be scheduled for January, 2016. City Planning staff will be notifying neighbouring residents. My office will be providing general notice throughout Ward 14. If you wish to be added to the email blast list for this application, please send an email to my office at councillor_perks@toronto.ca, with subject line 1182-1221 King Street email list. An Ontario program started to take applications in October 2015 called Ontario Electricity Support Program (OESP) to give some relief to individuals and families with high electricity bills. The program is for eligible low-income households across the province to receive a credit on their electricity bills in 2016. To qualify for this credit is depends on the amount of people living in your home and the combined annual income. In order to get approved you must apply on the Ontario Energy Board website and follow the instructions. Once you do get approval it will automatically be reduced from your bill as soon as six to eight weeks later. You must re-apply every two years to continue to get the credit. There are higher levels of assistance for electrically heated homes or where there is a reliance on medical devices using a lot of power. 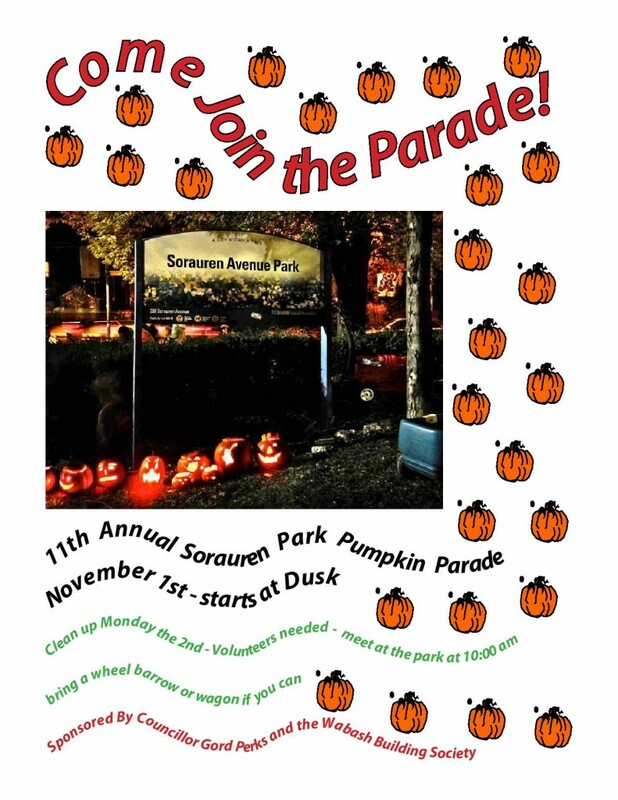 Sorauren Park, Monday, Nov. 2, starting at 10 a.m. The bylaw, http://www.toronto.ca/legdocs/municode/1184_918.pdf has raised concerns from many of you about the impact of temporary parking currently allowed on private property in South Parkdale during the Canadian National Exhibition (CNE). You have raised concerns about the volume of traffic looking for a parking spot on a private lot , the ‘street permit parking‘ space left vacant to provide driveway access to a private lot, vehicles driving over curbs to enter private property spots causing safety issues for pedestrians, and more. The Staff report is now available online http://app.toronto.ca/tmmis/viewAgendaItemHistory.do?item=2015.TE12.54 to review prior to the community meeting. 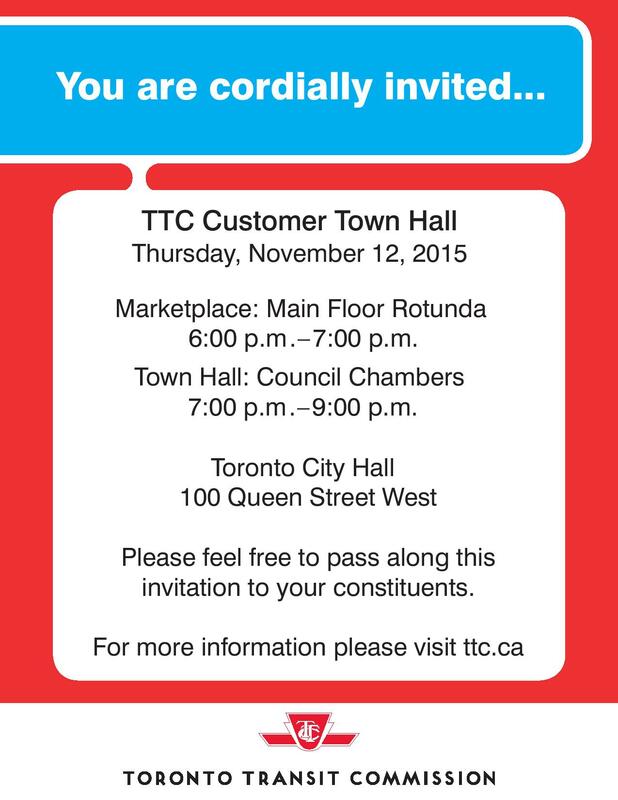 The report is will be presented at the November 10th Toronto and East York Community Council. I hope you can attend the community meeting. Please feel free to contact my office if you have any questions or if you are unable to attend but would like to stay informed. Please share this reminder with your neighbours. Invitation to the the 8th Annual YIMBY (Yes in My Backyard) Festival on Saturday, October 31st at the Ted Rogers School of Management at Ryerson University. The annual YIMBY Festival is a free, city-wide event celebrating community-based action and ideas in Toronto. The event provides a social space for people and groups involved in grassroots, locally ­driven civic action to gather, exchange ideas, and imagine their future city. At YIMBY, community groups, local businesses, neighbours and politicians come together in the spirit of positive change. This year’s YIMBY festival will welcome 104 unique Toronto-­based groups involved in community development, civic literacy, neighbourhood improvement, environmental action, arts and culture, and economic development and features programming for the community, by community groups.